Excellent emplacement dans le centre-ville de Vancouver. Ceci est un endroit confortable et propre qui vous fera vous sentir à la maison. Profitez de la vue sur la montagne incroyable depuis le balcon. 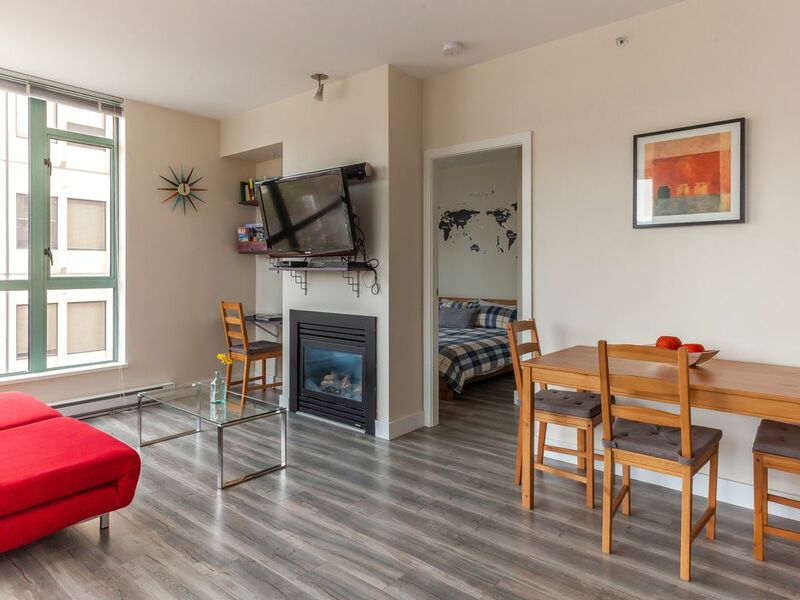 Les installations comprennent en blanchisserie suite, WiFi, salle de gym, sauna, bain de vapeur, LCD 42 'TV, blue ray, et Netflix ..
Juste au milieu de deux quartiers animés: Davie Village et Yaletown. Beaucoup de restaurants, bars, boutiques, juste en dehors de la région. Salles de cinéma, Vancouver Art Gallery et Bibliothèque publique de Vancouver sont de 10 min à pied. Quatre pâtés de maisons de la célèbre Vancouver Seawall et de la plage. Parfait pour une promenade ou une balade à vélo. Facile et accessible le transport en commun: 4 bus circulent à droite sur la rue Burrard, Skytrain et Canada Line sont à 10 minutes. Ce qui rend ce lieu unique? 3- Pain, beurre, confiture, beurre d'arachide, café et thé à volonté. Vancouver offre un large éventail d'attractions: si vous aimez la nature, visites, shopping, restaurants, vie nocturne, culture. Cet endroit est accessible à pied à un grand nombre de ces attractions et / ou les transports en commun que vous avez besoin pour se rendre à eux. The condo was well equipped and comfortable and just down the street from St Paul's hospital though the living room was so uncomfortable it would be unbearable for people with some medical issues. I would stay again if the sofa bed was replaced. Maya is a good host. We didn't have problems with access or condo management. Hi Barb, thanks for your comments. Sorry the couch was not completely comfortable for you. I just got two big cushions and placed them on the couch to help guest to sit more comfortably. Hope this helps. On the surface this place is pretty good - nice location, secured underground parking, full kitchen and good amenities but there are numerous small issues that detract from the charm. The place needs a good cleaning - dust build up on various surfaces caused allergy issues. The floors weren’t clean either. The grout around the bathroom sink is black with mold, as are parts of the bathtub (especially corners). The exhaust fan in the bathroom is completely blocked with dust. The shelf in the bathroom also needs new plaster/drywall. The bed squeaks loudly whenever you move, the trim around the bedroom windows is also black with mold. The closet doors don’t open fully due to an alignment issue, and the kitchen drawers can’t be opened unless the refrigerator is also open (due to clearance issues). The entry light doesn’t work, there are no bins for recycling and we couldn’t find extra trash bags. The sofa was terribly uncomfortable and the noise from the street kept us up most nights (until we found that the windows weren’t latched shut). The mini blinds have a few issues and don’t keep out much, if any, of the city lights. The pillows and other bedding are also well-used and could be replaced. Then there’s the issue of short-term rental, which is an issue throughout Vancouver so being discrete felt a little awkward. Also, turning the keys back in at the end of the stay is impossible if you are parked in the garage, and requires two people to coordinate locking of the apartment and unlocking of the elevator. The view wasn’t exactly amazing. The apartment looks out over a gas station and into a couple other apartments. No water or mountains in the view. Overall it was a cute place and we did mostly enjoy the trip. This place could use some maintenance, however, and was a bit pricey when considering the furnishings and other little niggles. Jenn, thanks for your comments. The cleaning is done by a professional company and I addressed your comments with the cleaning team to be extremely thorough in those details, but I can assure there is no mold in the bathrooms. The apartment is on a main avenue, so yes there is some street noise, as it would be expected in the downtown core of a city. On the other hand everything is very close and you can walk pretty much everywhere. Downtown is a busy area so you will find some avenues noisy. I ask my guests to be polite with neighbors and personnel at all times, and to be discrete as to not talk about short term rentals in elevators or public spaces, not as to "hide" or anything. Short term rentals are a sensitive topic in so many cities in the world, so guests need to come with an open mind and understand this is not a hotel and works a bit different. The check out process is designated to facilitate people doing self-check out. If you are driving all you have to do is taking your car out of the parking, and come up to a 6th floor to drop the key, which takes 5 minutes. I haven't heard complaints from other guests about the process. I was especially pleased with the amazing location! It is close to everything I was looking for during my stay in Vancouver. Many attractions are within walking distance. For the price of a basic hotel room, this condo has everything needed and then some. Maha was easily accessible when I had questions. I would most definitely stay here again. Thank you! Thanks a lot for your review. You were a fantastic guest as well. Took very good care of my place. I would love to host you again any time. Thank you. Glad you enjoyed your stay! The apartment was exactly what the photos showed. The bed was very comfortable. The location was great. There's such a variety of restaurants in the area. It was only a 20 minute walk to the waterfront. The apartment has everything you need. I really appreciated the can of coffee and filters for the coffee maker. I loved sitting out on the balcony, it was a great view. Thanks for your comment. I am happy you enjoyed your stay and you are welcome to stay any time. Make sure to bring your own travel insurance.